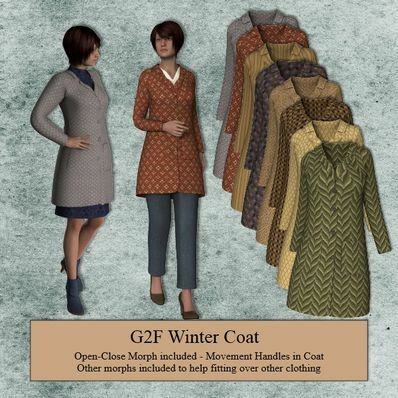 Winter Coat for Genesis 2 Female for use in Daz Studio 4.6. Movement handles in coat, plus Open-Close Morph and various morphs for fitting over other clothes. Thank you, hoping this does the trick. Thank you for the open/close morphs, you always think of everything. Wonderful winter coat. Thank you so much for this. Earlier this year I began to learn DS after several years of exclusively using Poser. I have been considering G2F for several months and now am looking for some content without breaking the bank. This is very much appreciated. Your clothes and shoes always work for me unlike others...thank you and have a Merry Christmas!! Thank you so much for all your wonderful clothes and shaders, they are superb and fill a very large gap in sensible clothing in my runtime. Very much appreciated, thanks again. I wish you a very merry Christmas. Thanks for the coat. It'll make a nice Christmas gift for my 3D,lol. Great clothing...thanks for all of it. One question...I have several female characters in illustrated stories that I write who work hard and are tough. I have had a real challenge finding clothing that is suitable for outdoors work on a farm or archeological dig or just chasing a bad guy down a dark alley. I'm trying to find an assortment of casual and outdoor clothing that is practical for tough, active female characters. Do you have anything in the works? Or is there someplace you can point me to for Genesis 2 clothing of this type? My girl G2F thanks you for the lovely winter coat... She will need it living in cooooooold Ohio ;) Happy Holidays!!! Lovely coat, Thanks. O, @Atrion, just a suggestion; after you login just hit your back page arrow twice and you'll be back to the download item. Thank you very much for this beautiful coat. Oh baby it's cold outside! Thanks Wendy. It is a lovely coat. Another great freebie. Thanks very much! Thank you for this wonderful coat! It's on the To-Do list, but my son can only do these things in his spare time. Just a suggestion for the website, it's a pain to have to go look for the item again after logging in, maybe it could have a java script to send you back to the item page? Very cool stuff, thank you. Wendy, thank you! Needed a winter style jacket for some time - great work! Working OK for me. Can you try again? Sorry about that. I thought I had uploaded the correct files. Now updated.